ปั้มชนิดนี้มีระบบอิเลคโทรนิคควบคุม ปรับความดันให้คงที่แม้ในช่วงเวลาต้องการใช้น้ำปริมาณสูง ติดตั้งง่าย ประหยัดพลังงาน เหมาะสำหรับ อาคารสูง โรงพยาบาล โรงแรม และ ในอุตสาหกรรม. 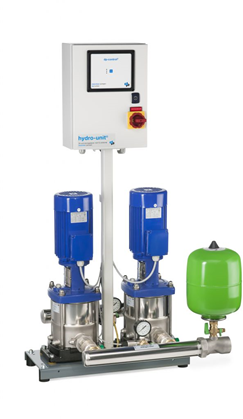 The Hydro-Unit HR is the most energy-efficient solution of the conventional installations. The installation saves 60% of energy costs compared to a standard booster system. Adding an expansion tank membrane with modified volume makes optimal use of the necessary pump run time for installations. The Hydro-Unit FR is equipped with the intelligent control module Megacontrol. This module, in combination with built-in frequency drives, ensures a constant pressure regardless of the demand for water. The advantage over the conventional fixed speed control is the low energy consumption. A saving of over 25% can be achieved. More information about the technical requirements of a drinking water installation? Download the Water Work Sheets and Control Measures (Dutch).